What's Next for Overnight Parking Changes in State College? Changes to overnight parking in State College will wait at least a few more weeks. 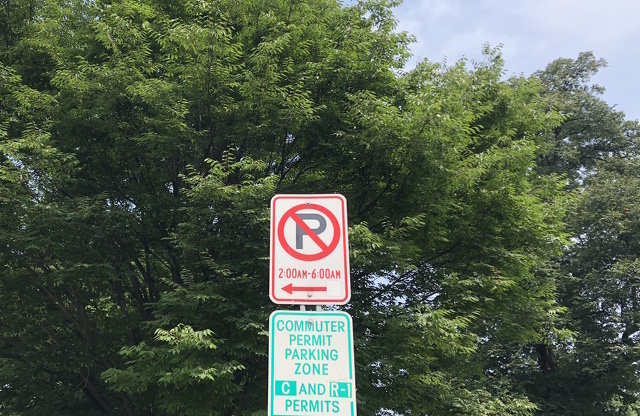 At a special meeting on Monday, State College Borough Council failed to override Mayor Don Hahn's veto of the parking ordinance amendments, which would create an overnight permit system pilot project in the Highlands neighborhood. Council members voted 4-3 to override the veto, but five votes were required. Council members David Brown, Cathy Dauler, Janet Engeman and Theresa Lafer voted in favor of overriding the veto, with Jesse Barlow, Dan Murphy and Evan Myers voting against. After the override vote, council unanimously voted to refer the proposal to transportation commission for review at its Sept. 11 meeting and to schedule a public hearing and vote at borough council's Sept. 17 meeting. The ordinance was originally expected to go into effect on Oct. 1 had it not been vetoed. Borough Manager Tom Fountaine said that if council approves it at the next meeting, it would likely be pushed back to mid-October. Last week council voted -- in the same split as Monday's vote -- to formally establish a 20-month pilot project for an overnight permitting system in the Highlands and to codify the longstanding practice in the rest of the borough of not enforcing 2 a.m. to 6 a.m. parking restrictions during Penn State football weekends and other special events. Hahn, however, immediately indicated his intent to veto the ordinance saying -- as he wrote in a letter to council on Aug. 1 -- that he believed transportation commission should have an opportunity to review the Highlands pilot and that the community should have another chance to be heard. Citing negative effects of increased traffic and street parking, Highlands Civic Association requested in 2017 that the borough try enforcing the 2 a.m. to 6 a.m. restriction during football weekends. Borough staff studied the issue and transportation commission recommended enforcing the restriction at all times. Borough council instead decided on the permit pilot project, which was not reviewed by transportation commission. Those who voted in favor of the ordinance were critical of Hahn's decision, questioning why he waited until August to raise the issue when council initially voted in favor of the pilot, 5-2, in April. They also suggested that Hahn had blurred the lines between council member and mayor. Engeman said on Monday she felt Hahn's veto was "arbitrary" because the pilot established by the ordinance was the same as what was approved in April. Dauler said that because it is a pilot project, adjustments can be made along the way. Hahn said he thought what was approved in April would be discussed further before moving to an ordinance. "I do tend to err on the side of caution and deliberation," Hahn said. "When staff proposed the pilot program on April 16, I thought it was a step forward. Others thought it was mission accomplished. I thought it forwarded the debate, others thought it ended the debate at least for 20 months." He has said that if transportation commission reviews the ordinance and another public hearing is held, he would not veto it again. Though his Aug. 1 letter made other suggestions "as a citizen" for changes to the proposal, Hahn said his veto decision was procedural based on the need for further input. "I fully expect them to endorse the pilot program as a good step forward," Hahn said. "Nevertheless I think the transportation commission needs to be able to weigh in." Hahn cited his past experience on borough council. He noted that in 1996 he voted in favor of traffic diverters in College Heights, which were favored by the College Heights Association. After they were implemented, he heard from many community members who were opposed and experiencing negative traffic impacts. Lafer told Hahn he's not on council anymore and doesn't have a vote. She said that there already has been a public hearing and plenty of community input, and she added that visitors for football weekends who do not have a resident who can get them an overnight permit can afford to park in a garage if they can afford Penn State football tickets. "I would appreciate if people would vote to override so we can give this pilot program a chance and if it doesn’t work we’ll repeal it," she said. "It’s as simple as that." Barlow said he recognizes there is a parking problem in the Highlands but that it "deserves a long-term solution." He noted that the pilot proposal was not reviewed by transportation commission and when he voted for it in April he believed it would be further refined. "I do want this problem resolved but I want it done right," he said. "The permitting part of it deserves more review than it has received." The pilot project would create a system that will require Highlands residents to get a temporary permit for their guests to park on streets that otherwise restrict parking between 2 a.m. and 6 a.m. Each residence will be allotted 24 non-event overnight parking passes for a $24 fee, and 36 more at a cost of $5 each. On home football weekends and during Arts Festival, however, they will be required to pay $10 for an overnight permit. Penn State linebacker Manny Bowen is no longer with the team the program confirmed on Monday afternoon. The Nittany Lions' most updated roster sent to media members prior to this weekend's season opener did not include Bowen. 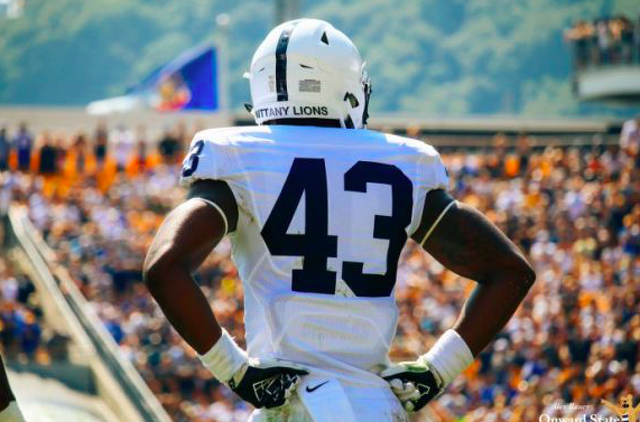 “Manny Bowen is no longer on the Penn State football team. We wish him all the best.” A spokesperson said.